How to Merge Messages from iPhone to iPhone? I bought a new iPhone Xs, which is an upgrade from my previous iPhone 5s. The old iPhone has messages that are important to me and I wanted to merge them with my iPhone Xs. I have a fear that if I choose to restore, I may lose the newer messages as well. How can I merge messages from my old iPhone without erasing anything from the new? Many Apple users have experienced such problems when upgrading to a new device and it can be a little bit tough on your side especially if you can't find a way out. If you are struggling with merging messages from iPhone to iPhone, here is the guide of what you need to do to ensure that all your previous conversations are sent to your new Apple device without any data loss during the process. Can I Merge Messages from iPhone to iPhone? How to Merge Messages from iPhone to iPhone (iOS 12 Supported)? Can I Merge Messages from Old Backups to iPhone? 1. Can I Merge Messages from iPhone to iPhone? Most often when we don't find a solution to our problems we seek answers across several forums including Apple. The sad reality is that you might find all sorts of negative answers across these platforms. Furthermore, iTunes and iCloud cannot do this. Airdrop cannot do this, either. However, we discovered a tool that can do this smoothly. 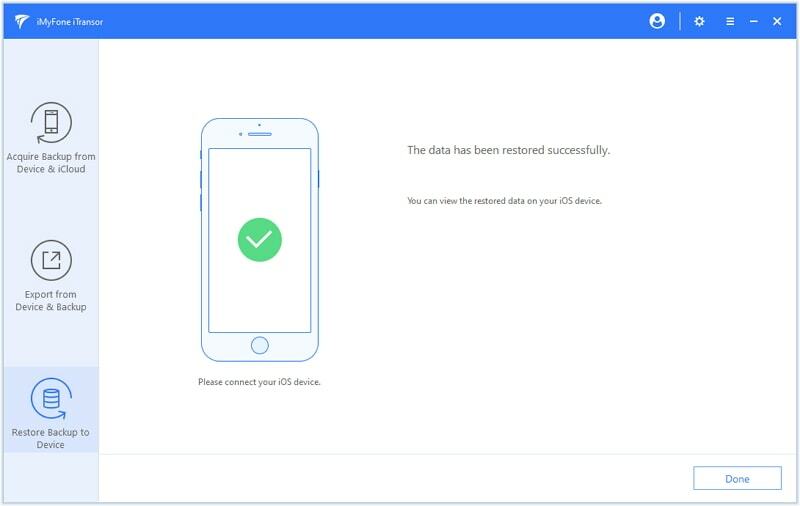 iMyFone iTransor is a better alternative than iCloud or iTunes as it can Selectively back up and restore iPhone, iPad, or iPod touch without any data loss. You can back up SMS, contacts, WeChat, or WhatsApp totally for free. The restore process of iMyFone iTransor doesn't involve any data loss on the target device. 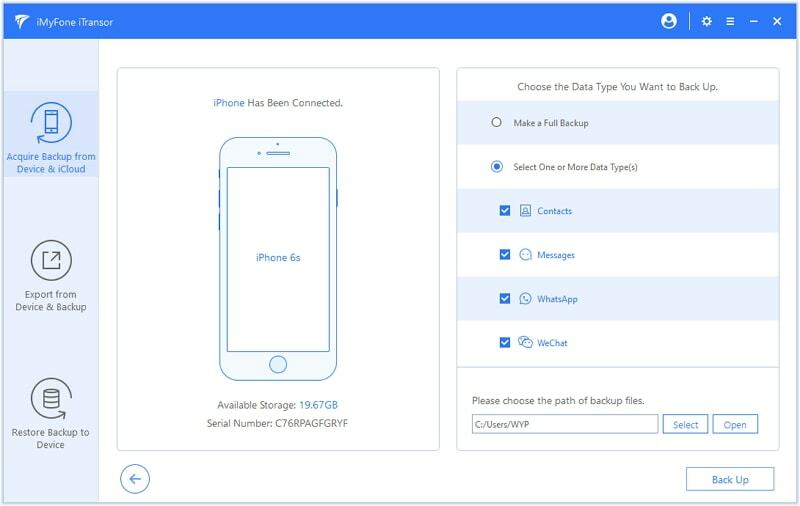 In addition, you can view and export more than 18 data types from your iOS device or backups made by iTunes or iCloud to Windows or Mac computer for more uses. Since it supports all iOS versions and devices, including iOS 12 and iPhone Xs, you do not have to worry if it will work on your latest Apple device as it can handle that too. 2. How to Merge Messages from iPhone to iPhone? iTransor makes it possible to merge Messages from your old iPhone to a new one using two steps. First, you need to back up messages on old iPhone, and then merge the backup to messages on the other iPhone. Download and launch the program on your computer before you start. Step 1. On the left panel, choose Acquire Backup from Device & iCloud then click on Back Up Device. Step 2. It will direct you to the next screen where you need to connect your old iPhone to proceed. iTransor automatically recognizes your device after trusting computer on your iPhone. On the right column, choose Select One or More Data Type(s). Choose Messages and the path where you want to back up your files. You can choose more types if you need. Step 3. Click on Back Up to initiate the backup process. You will be notified that the data you selected has been backed up successfully once the process ends. Afterward, you need to restore the backup to your new device by following the steps provided below. Step 1. Navigate to Restore Backup to Device tab and then choose the backup made just now and click on Next. Step 2. Choose one or more data types on the next screen including Messages and any data you wish to restore. You can then choose Directly Restore to proceed to the next step. Step 3.Choose Merge from the pop-up, which will combine the chosen data with the data on your device. Step 4. After the restore process is complete, the messages on your old iPhone have been merged with the ones on your new iPhone. 3. Can I Merge Messages from Old Backups to iPhone? Apple doesn't offer the means to merge items in backups and the Apple Engineers may not help you either as they have no real solutions. So the best alternative will be to find a third party app that can do it. Unfortunately, the ones that exist online only have the ability to replace, but not merge. However, iMyFone iTransor is has proved its efficiency in merging messages from old backups to iPhone without any data loss. 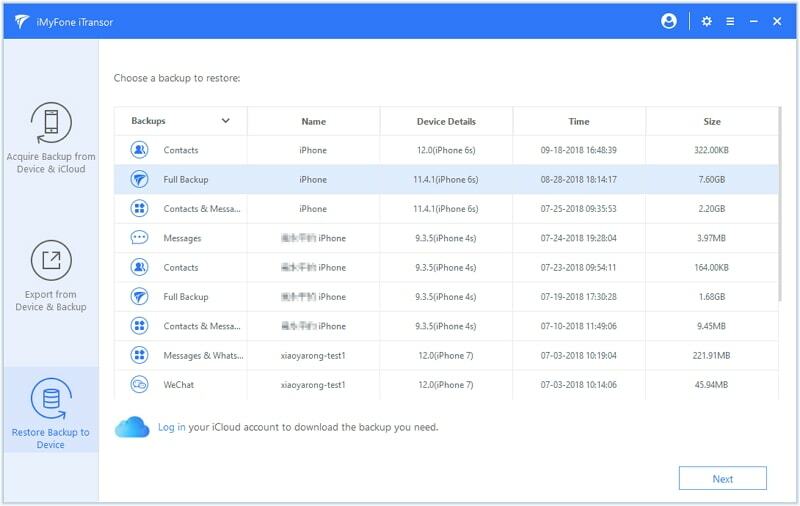 How to Merge Messages from Old Backups to iPhone? Step 1. 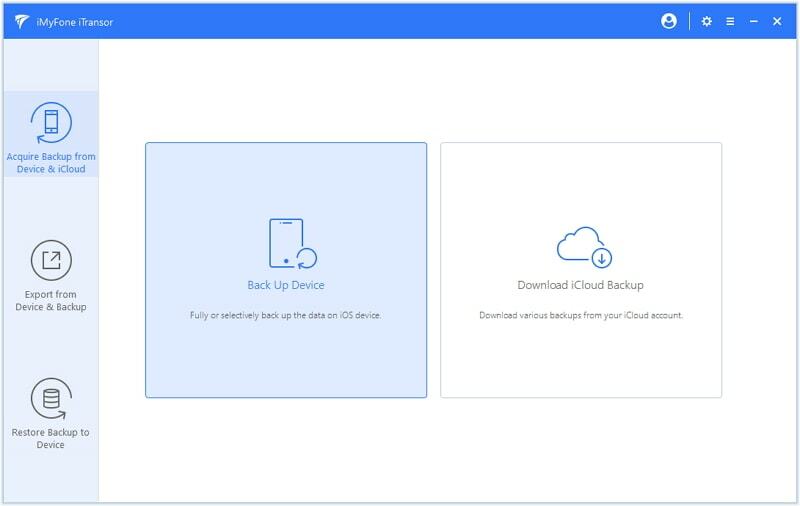 Navigate to Restore Backup to Device tab and choose one backup file from the list after launching the program. Click Next to proceed. Step 2. Click on Restore Partial Backup. 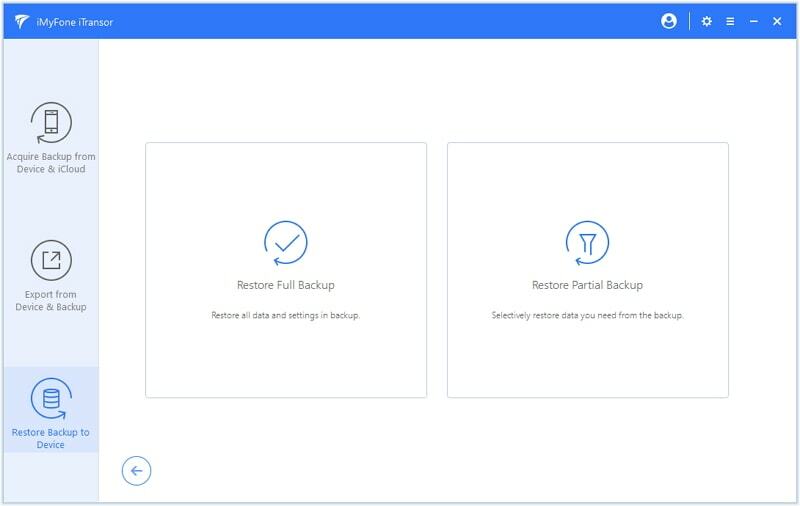 This feature selectively restores the data you want from the backup. Step 3. Choose one or more data types on the next screen including Messages. You will be required to choose between Directly Restore or Preview & Restore to proceed. If you pick Preview & Restore then the program will display the messages in the backup for you to view. Step 4. Click Restore to continue. Choose Merge from the pop-up. 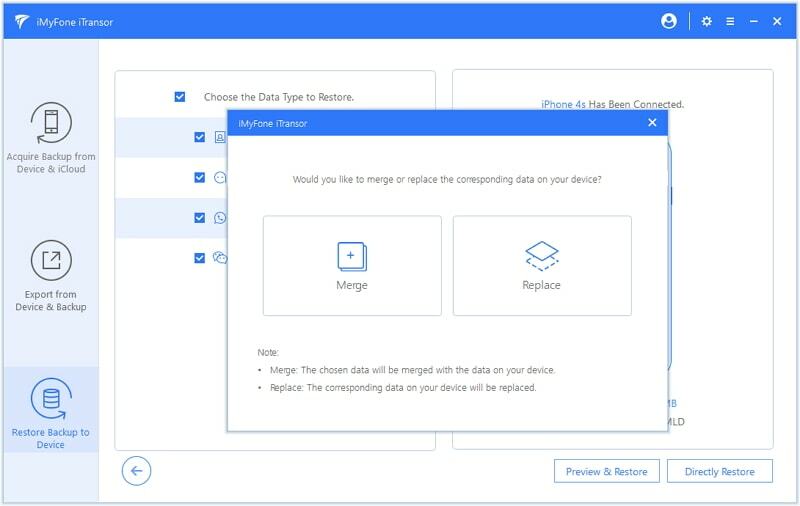 The Merge option combines the data in the backup with those on your iOS device. After restore process is complete, you can check the messages on your device. 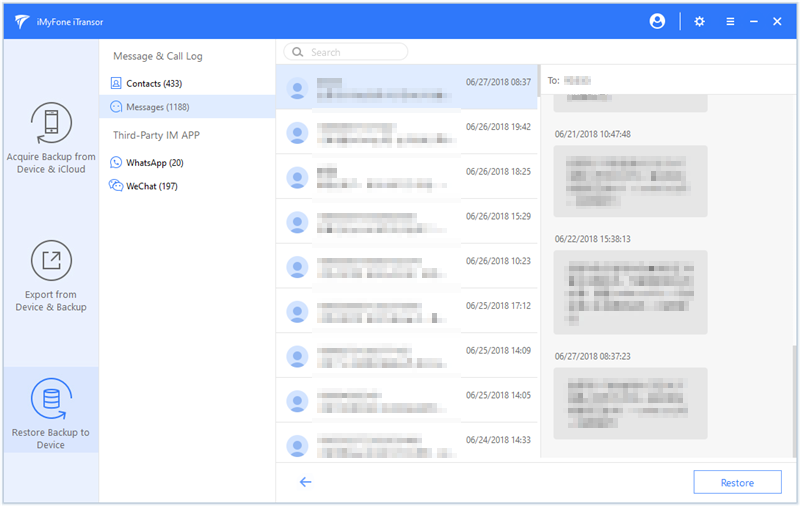 Since Apple does not offer a solution to merge SMS from iPhone to iPhone, the best decision you can make is to choose third-party software that can safely merge messages from iPhone to iPhone. 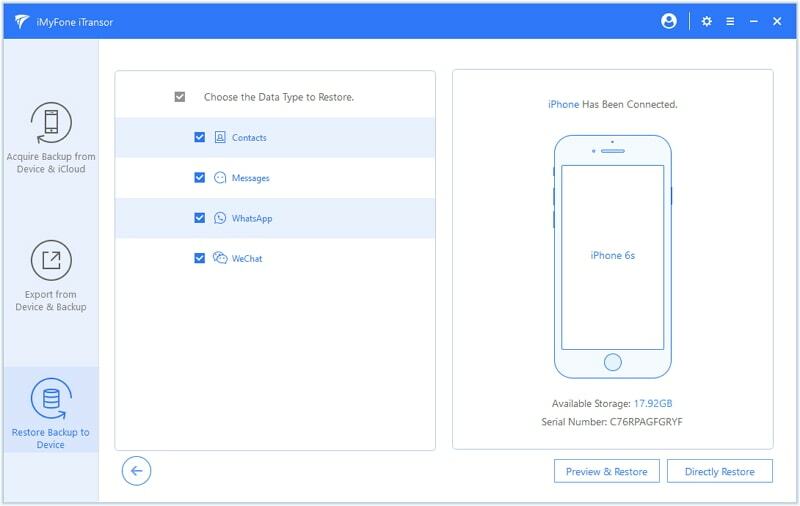 iMyFone iTransor provides great control over your devices without causing any data loss during the process as it sorts and merges the data you need only. Download its free trial version and give it a show now!